The presence of a Team Red can make a blood donation drive fabulous. Here we explain the various roles that the Team needs to play during the blood donation drive. Confirm that the donors have not smoked in last 2 hours and have had their lunch. Make people sit in a semicircle for discussion. Inform the donor about the various FAQ’s given in the donor’s guide. Encourage donors to ask questions and get their doubts clarified. 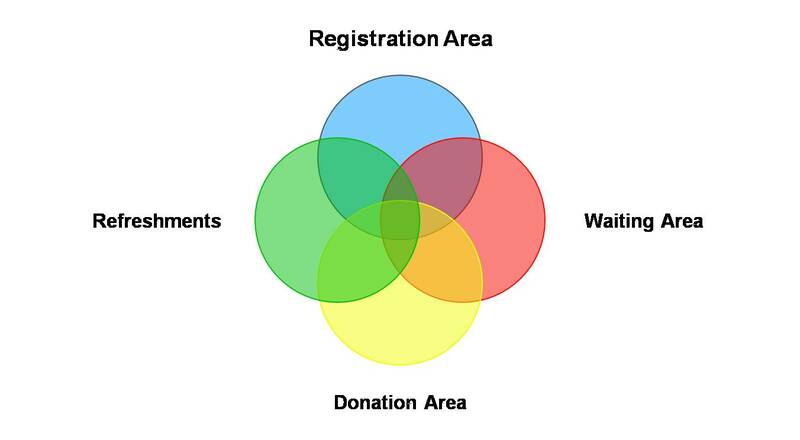 Ensure that the donors do not crowd around the donation area. Ask if anyone is a regular donor. Make the person share his/her experience to motivate others. Provide the Donor Information Leaflet if you cannot continue to involve them in a discussion. Ensure that haemoglobin, blood pressure and weight is tested for every single donor. Ensure that the donor does not get up immediately after finishing donation. Talk to the nervous donors and distract them immediately prior to start of the donation. Explain the need to keep pumping the sponge. Explain the need to lie down for extra 5 minutes after donation. Request the donor to send back at least 2 more people. Explain post donation care as given in the Donor’s Guide. Donating blood is a pure choice of the donors. Never try to judge a person by his/her willingness or unwillingness to donate blood. For all you know, he or she may have issues that they do not wish to discuss with you but which have an impact on their blood donation. Always wear a smile and maintain extreme levels of politeness and friendliness. You must make yourself very approachable. Thanking Donors Irrespective of the fact that a person is allowed to donate or not, thank them (genuinely) for coming forward to donate blood. Ensure that there is no argument at all during the entire process. We do not want any debates or argument at a place where people have come to do something good. Maintain a calm and composed atmosphere. Bring it to the notice of the concerned person if he/she fails to notice. Continue working on what you were doing. Do not allow the shift of attention to that person or that spot. Please do your job the best you can and trust the others to be doing the same. Please do not talk among the volunteers. Focus all attention towards the donors. Treat all donors equally irrespective anything else. Any special attention towards one donor makes the others feel bad.